Hear new song “Los Ageless” now. 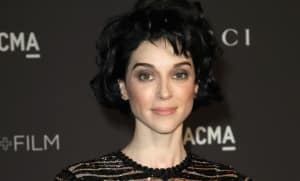 St. Vincent has confirmed details of new album MASSEDUCTION. The album, Annie Clarke's fifth solo studio record, will be released on October 13 via Loma Vista. New song "Los Ageless" is streaming below ahead of the album release. In a mock press conference announcing the album on Facebook, Pitchfork notes, Clarke said that “literally the only point” of the album is that it is about love, and stressed that the title is pronounced “Mass Seduction,” not “Mass Education." St. Vincent's previous single, "New York," is widely speculated to be about her relationship with model Cara Delevigne. St. Vincent tours throughout the fall. Fans who bought a bought a ticket to any of the North America dates will receive a digital copy of the album with their ticket. This offer does not apply to fans in Boston, Indianapolis, or Detroit. 11 "Dancing with a Ghost"